Oak Park is a city located in the Outside Los Angeles region. 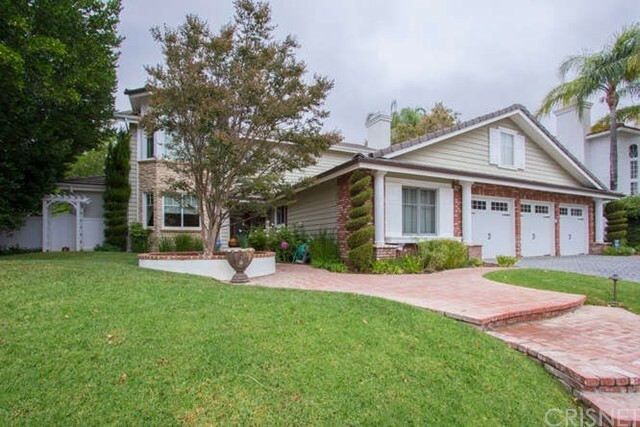 Oak Park is located near Agoura Hills, Calabasas, Bell Canyon, Calabasas Highlands, Calabasas Park, North Hollywood, Hidden Hills, Simi Valley, West Hills and Lake Sherwood and is comprised of the 91377 zip code. The real estate conditions in Oak Park are considered to be a "Seller's Market", which means the demand to purchase homes is greater than the supply of homes available for sale. Description: perched high on a hill and located at the end of a cul-de-sac, this home has a wonderful mountain view from the back of the house. this neutral light & bright floor plan has 4 bedrooms plus 3.5 baths. family room adjacent to kitchen has a built-in entertainment center which includes bookshelves and storage cabinets. master bedroom features vaulted ceilings, sitting area and walk-in closet. double sinks in master bath with separate tub, shower and water closet. plantation shutters downstairs. secondary bedrooms are extra large and one contains an en-suite bath. two sets of french doors lead to side & rear patios. newer pavers plus built-in bbq with serving counter complete this entertainer's backyard. great award winning oak park public schools. walk to nearby oak hills elementary school, which is adjacent to park and athletic fields. close to drive-through starbucks, shopping, and conveniences. priced to sell. Listed By: Andrea Jacobs of Coldwell Banker Westlake Vlg. Description: contractors, flippers & investors must preview this great opportunity. located on a wonderful quiet cul-de-sac street with fantastic views of the surrounding mountains. built-in entertainment center in family room and french doors out to private backyard patio. newer pavers, built-in bbq and serving counter in yard. ceramic tile flooring in entry, kitchen, breakfast area & baths. plantation shutters on downstairs windows & some up. neutral, light and bright home with in a quiet setting. double sinks in master bath and sitting area in large master retreat. secondary bedrooms are all extra large and one is like a master with en suite bath. great oak park public schools and oak hills elementary is a short walk. public park & athletic fields adjacent to school. shopping & conveniences are close as well. must preview this well priced home. Listed By: Andrea Jacobs of Coldwell Banker Westlake Vlg.